Heat oil in large non-stick skillet over medium heat until hot. Add potatoes, cover and cook 15 minutes, stirring frequently. Add sausage and green pepper; cover and cook 5 minutes, stirring occasionally. 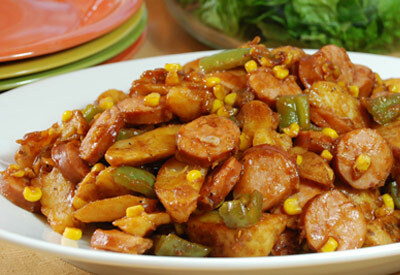 Gently stir in corn, barbecue sauce and black pepper. Cook until heated through, about 2 to 3 minutes.